Paula Urbano investigates actual and historical conceptions of belonging in Black hair white masks as seen through the portrait of her Swedish-Chilean family. 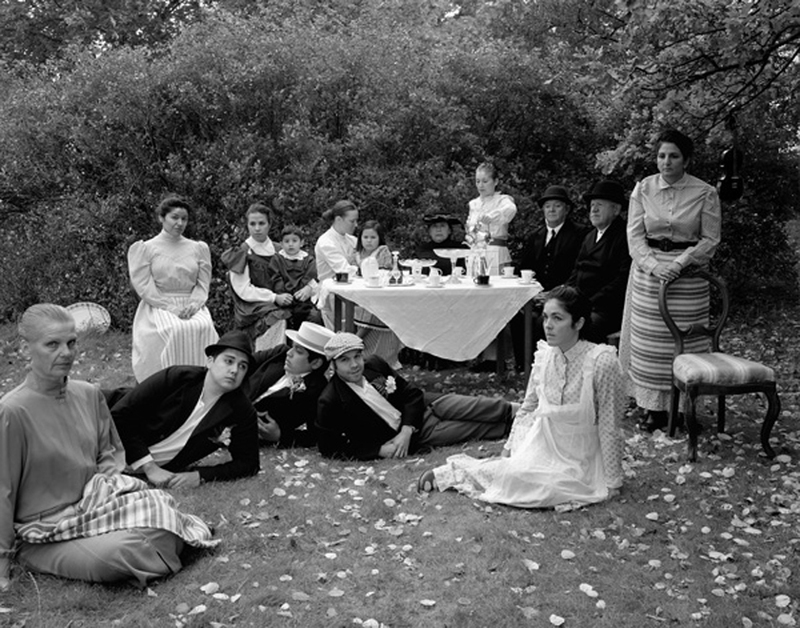 The photograph portrays a meticulous reconstruction of a family portrait taken in 1897 in Sweden. The original portrait, found by the artist, is rich with signifiers depicting an idealized and bourgeois Swedish family. The people are well dressed yet romantically and idyllically posed in a forested bower where they gather around an elegantly laid table. The value placed on nature, still keenly present within contemporary art, film and design in Sweden, is brought forward in the original image through a poetic gesture of mutual belonging: the family are depicted as having an affinity and relaxed relationship to the landscape and the landscape appears to be activated by the presence of this idealized, appreciative family moment. Urbano’s recasting of this photograph subverts and comments on multiple layers of value systems contained in the original photo. Questions about belonging as well as about identity, nationality, migration and immigration come forward and query how we envision the historical past. Despite the clear staging of the original photo (seen in the attitudes of the lounging youth and dignified postures of the elders) the re-enactment shifts the reading of the photograph from family portrait as a performative gesture to it being a critical and politicized inquiry. Which individuals are permitted to occupy these romanticized historical depictions in our social imaginary? In replacing the turn-of-the-century Swedish family with her own who came as political refugees to Sweden in the 1970’s, Urbano explores the impact of re-writing history to place immigrants in central positions. She does not choose to do so by inserting immigrant identities into a visual imagining of political or financial privilege structures but rather, she delves deeper into the dominant social fabric by investigating the impact of inserting a minority identity within conceptions of core “Swedish” experiences both socio-historical and domestic. The impact of this re-imagining by Urbano reveals the barriers reinforced through unspoken categorization of and expectations for “New Swedes”. Black hair white masks, despite its aesthetic grace, complicates the social order created in many European countries in which an individual’s country of origin is privileged as their primary identity or nationality regardless of their context or immigration status. In response to this, Urbano introduces multiple generations and experiences of intersectional and bi-cultural identities within her re-staged tableau. In this way, Black hair white masks shifts the roles and the relationship to context for both the members in her family’s re-enactment and for the subjects of the original photograph. Black hair white masks creates space to problematize and to challenge dominant conceptions of social history and further, to use that space for the acknowledgment of a plurality of identities existing within Sweden in our globalized present. This entry was tagged appropriation, identity, Migration.